Plymouth Township -- whose job market is based largely on the troubled auto industry -- has been working hard to attract more diversified employers lately. A number of new research and development firms have moved into the area, and some existing businesses have branched out into energy. The township gets high marks for education (the local high school looks more like a university campus) and for lesiure activities (Township Park for the kids; the adjacent 18-hole golf course for their parents). --D.G. 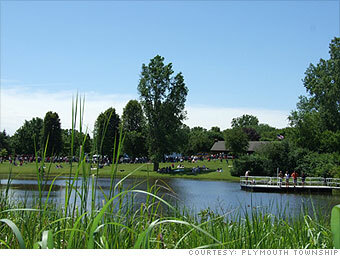 Is Plymouth Township a great town, or what?